Okay, back to Daredevil and Shadowland! Coming up is a brief look at Shadowland: Power Man #3, which came out last week, and Shadowland: Moon Knight #3 and Thunderbolts #149 which came out this week. This issue reveals a lot of information, including where young Victor Alvarez got his powers and how he’s connected to Danny Rand. However, while still an okay read, this is the least enjoyable issue of the mini-series so far. The main problem I have with this series at this point is that there seems to be at least one adversary too many. I think the reason for this is to supply the new Power Man with the beginnings of a rogues gallery after Shadowland is over, but it gives the story a sense of being all over the place. This is also where the connection to the Shadowland background story starts to feel forced. The ninjas Victor fought in the first issue decided to go after him and finish him off after Daredevil lifted the ban on killing in Shadowland #2 (and as seen in the second issue of this series). Considering that the Hand ninjas don’t seem to be real big on taking initiative in any other scene we’ve seen them in, this gets a little absurd. Can they just walk off like that? Having said that, I do belive that the new Power Man is a character with potential and that Fred van Lente has gone a long way toward infusing Victor and his world with enough heart and heartbreak to make us care about what happens to him and his family. The troubled teenager with family and secret identity problems has proven successful in the past and this is a new twist on an old theme. Asrar’s art continues to impress without blowing me away. It’s a very good fit for this kind of story and is admirably easy to follow considering all the plot developments and characters we’re presented with. This mini-series comes to a close this issue and gives us a reasonably satisfying ending. Shadow Knight’s identity is revealed and Moon Knight goes off on a quest in search of an ancient artifact that promises to slay the Beast. I wasn’t the only one who was surprised to see a development crucial to the Shadowland event take place in the Ghost Rider one-shot, and we’re seeing something along the same lines here. Moon Knight going off to secure a weapon that may be hugely important to what’s going to happen in Shadowland #5 isn’t even acknowledged in the main series, but is developed in full here. I’m sure that people who are only reading Daredevil and Shadowland will be able to follow along without this information, but it drains the main book of much needed plot points. So far, Shadowland proper has been devoted mostly to two rounds of various heroes slugging it out in Daredevil’s new living room. This series has had another focus as well, one that hits much closer to home for the man who has now gone back to calling himself Marc Spector (oops, spoiler…) and this aspect of the story has been more interesting than the part that deals directly with the main event. Until this mini, I’d never read Moon Knight outside of his Civil War tie-ins and his appearances in Secret Avengers, and I do feel like I’ve gotten to know the character a little better. The art is perhaps the biggest weakness of this issue. It’s not unappealing per se, but it’s hard to follow in places, and it does take the story down a notch. 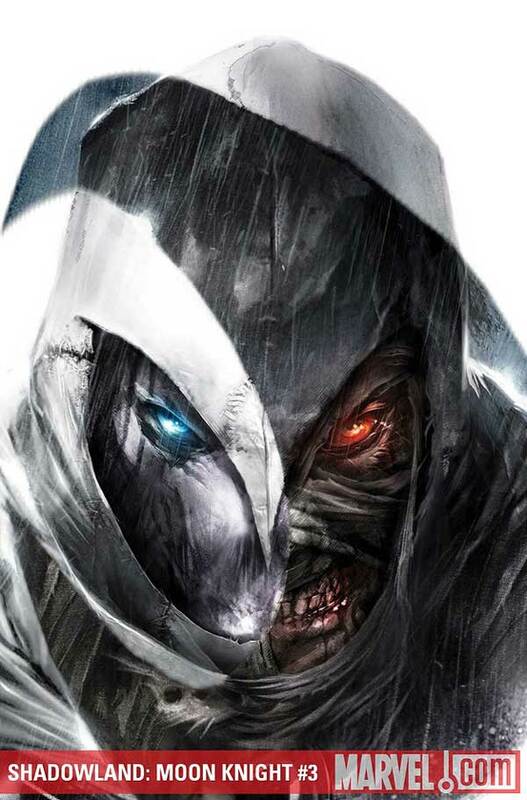 One problem is that Shadow Knight and Moon Knight are so similar that it’s difficult to sort out who’s who and it would have been great if their respective trademarks had been better developed. This issue works much better as an issue of the Thunderbolts than it does as a Shadowland tie-in. The interactions between the characters has been Jeff Parker’s forte since he took over the book and he continues that trend here. But do we learn anything about the Hand? Sure, but much of it seems, to me anyway, to be conflict with the main event. 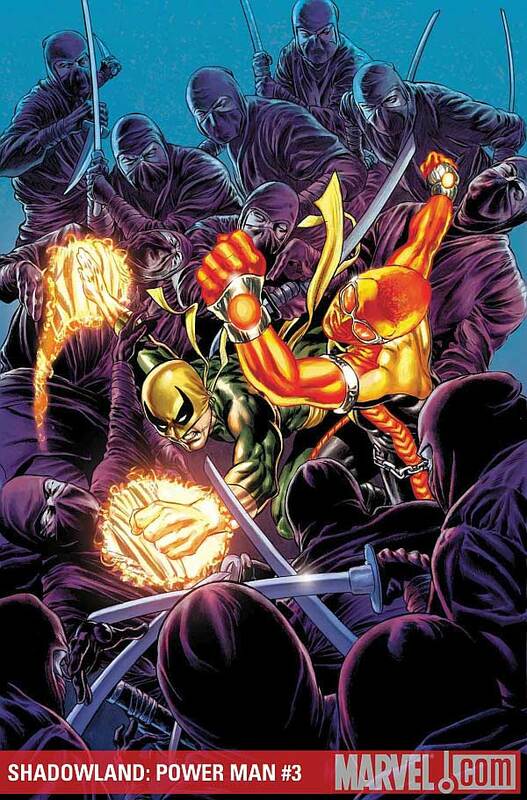 Suddenly the ninjas don’t seem to be completely useless and are even shown to have powers that we haven’t seen much of before, and the Shadowland underground seems impossibly large and crowded. I don’t have much more to say about this issue (it’s heavier on difficult to summarize character interactions than Shadowland-related plot development) except that Thunderbolts continues to be well-written and not too weighed down by its brief event tie-in status. Well, that’s it for today! Comment away. I had a blast with the Thunderbolts tie-ins. Your enjoyment of the book is proportional to how much you care about Shadowland. If you look at it as a stand-alone story rather than something tenuously linked to the main event, you’ll be better for it. I think I’m enjoying the Shadowland tie-ins a lot more than the main event. It’s rather sad when that happens because it shows you the potential the event could have had. Hi, I’m Marvel. I’m trashing your favorite character in every way I know how. Would you like to spend some more on money tie-ins? Yes Marvel. Thank you. Can you also kick me in the balls as hard as you can. You seem to know what like. While it may seem like these ties-ins are only in it for the money, I’ve heard great things about the Elektra one-shot, the Ghost Rider one-shot, Power-Man, and Iron Fist. So it’s not all a great loss. At least the tie-ins are okay. Thats like going to a restaurant getting a burnt steak, terrible service, the kid at the table behind you vomits on your shoulder, but the rolls were really good. As someone who has been reading Thunderbolts since issue #82, I am not at all happy with how this title is currently being utilized. Yes, the two Shadowland issues were the best since the beginning of the Heroic Age. My problem is that the book has no direction. 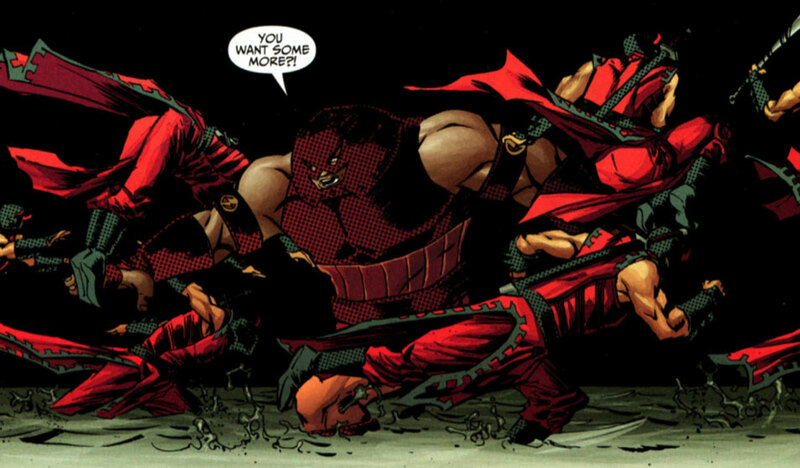 The Thunderbolts themselves aren’t experiencing any character development. This is a title that is constantly crossing over with other story lines/titles, and since I refuse to buy the other issues that are part of the story lines, the title is about as incoherent as a comic can be. This is my least favorite comic on my list. This isn’t even the Thunderbolts anymore. The premise is absurd, and the execution leaves a lot to be desired. 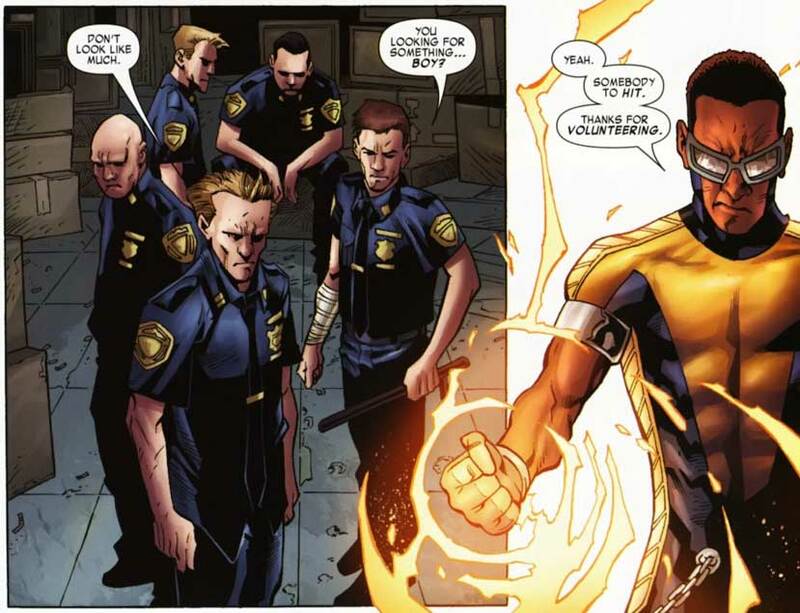 Anti-establishment man Luke Cage has no business working for the government. The inclusion of Crossbones is a disgrace. On top of it all, the characters who are actual Thunderbolts (Songbird, Mach V, Fixer) play a non-existent role in the title. Moonstone is the only true Thunderbolt that gets the spotlight. Ghost has been a good addition to the team, but shouldn’t be the focal point. To the Thunderbolts, the Heroic Age should be the era where the long-time members of the team step up and prove to the world that they have what it takes to be heroes, without being kept in check by the government or proven heroes. Yet another missed opportunity by Marvel. Parker is a great writer, but this title is borderline unreadable and infinitely aggravating. I’m guessing all of the people that are reading it now never read a Thunderbolts issue prior to the Heroic Age. This is not what a Thunderbolts comic should be. Somehow, it’s getting rave reviews. @Krakkaboom: In this case, I disagree with you. Thunderbolts is one of my favorite comics, and while I definitely wouldn’t call myself a longtime fan I’ve had it on my pull list for a little over a year (so before Heroic Age at least). I’m actually surprised that I like it as much as I do since I ordinarily don’t really enjoy team books nor really anything this action-heavy. Maybe I’d feel the same way you do if I’d ben a Thunderbolts fan since the very beginning, but it’s probably the less continuity conscious newcomers like me who are giving it rave reviews. 😉 I have no real concept of what this comic “should” be like and am just enjoying what I see. I’m glad you’re enjoying it, because it’s a title that I don’t even want to pay for anymore when I see it in my pull pile. Which is sad, considering how much I’ve enjoyed it over the nearly 70 issues that I’ve read. It used to be one of my favorite titles. I don’t blame Parker, I blame the premise. The writing is very good. It’s Parker, so of course it’s good. I’m sure this is just another editorial idea that the writers are forced to execute. 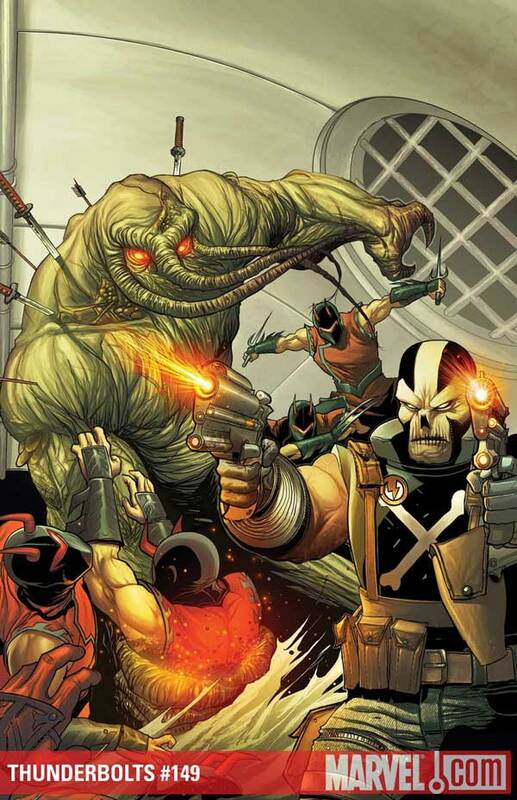 To me, most of the long-term members of the Thunderbolts should be back on the team to prove that they’re heroes, not villains, without being kept in a prison or babysat by trusted heroes. If they screw up, they answer to Steve Rogers. If you read Warren Ellis and Mike Deodato’s run on Thunderbolts, this is the exact same idea. Last issue’s $4.99 anniversary price tag for a reprint of an irrelevant (to the current story) issue was maddening. Sorry for the rant, but you know how you mentioned that there were missed opportunities to explore certain aspects of the Shadowland story that would have been great if they’d chosen to go that route? This is the same sort of thing. When what you read makes little sense and you seem to have more logical/interesting/better ideas than the editors/writers…it’s frustrating.